Adds a $BITMAP attribute to a given FileRecord. Vcb Pointer to an NTFS_VCB for the destination volume. FileRecord Pointer to a complete file record to add the attribute to. AttributeAddress Pointer to the region of memory that will receive the $INDEX_ALLOCATION attribute. This address must reside within FileRecord. Must be aligned to an 8-byte boundary (relative to FileRecord). Name Pointer to a string of 16-bit Unicode characters naming the attribute. Most often L"$I30". NameLength The number of wide-characters in the name. L"$I30" Would use 4 here. STATUS_SUCCESS on success. STATUS_NOT_IMPLEMENTED if target address isn't at the end of the given file record, or if the file record isn't large enough for the attribute. Only adding the attribute to the end of the file record is supported; AttributeAddress must be of type AttributeEnd. This could be improved by adding an $ATTRIBUTE_LIST to the file record if there's not enough space. Adds a $DATA attribute to a given FileRecord. FileRecord Pointer to a complete file record to add the attribute to. Caller is responsible for ensuring FileRecord is large enough to contain $DATA. AttributeAddress Pointer to the region of memory that will receive the $DATA attribute. This address must reside within FileRecord. Must be aligned to an 8-byte boundary (relative to FileRecord). STATUS_SUCCESS on success. STATUS_NOT_IMPLEMENTED if target address isn't at the end of the given file record. Only adding the attribute to the end of the file record is supported; AttributeAddress must be of type AttributeEnd. As it's implemented, this function is only intended to assist in creating new file records. It could be made more general-purpose by considering file records with an $ATTRIBUTE_LIST. It's the caller's responsibility to ensure the given file record has enough memory allocated for the attribute. Adds a $FILE_NAME attribute to a given FileRecord. FileRecord Pointer to a complete file record to add the attribute to. Caller is responsible for ensuring FileRecord is large enough to contain $FILE_NAME. AttributeAddress Pointer to the region of memory that will receive the $FILE_NAME attribute. This address must reside within FileRecord. Must be aligned to an 8-byte boundary (relative to FileRecord). DeviceExt Points to the target disk's DEVICE_EXTENSION. FileObject Pointer to the FILE_OBJECT which represents the new name. This parameter is used to determine the filename and parent directory. CaseSensitive Boolean indicating if the function should operate in case-sensitive mode. This will be TRUE if an application opened the file with the FILE_FLAG_POSIX_SEMANTICS flag. ParentMftIndex Pointer to a ULONGLONG which will receive the index of the parent directory. Adds an $INDEX_ALLOCATION attribute to a given FileRecord. Name Pointer to a string of 16-bit Unicode characters naming the attribute. Most often, this will be L"$I30". Adds an $INDEX_ROOT attribute to a given FileRecord. FileRecord Pointer to a complete file record to add the attribute to. Caller is responsible for ensuring FileRecord is large enough to contain $INDEX_ROOT. AttributeAddress Pointer to the region of memory that will receive the $INDEX_ROOT attribute. This address must reside within FileRecord. Must be aligned to an 8-byte boundary (relative to FileRecord). NewIndexRoot Pointer to an INDEX_ROOT_ATTRIBUTE containing the index root that will be copied to the new attribute. RootLength The length of NewIndexRoot, in bytes. This function is intended to assist in creating new folders. Only adding the attribute to the end of the file record is supported; AttributeAddress must be of type AttributeEnd. It's the caller's responsibility to ensure the given file record has enough memory allocated for the attribute, and this memory must have been zeroed. Adds a run of allocated clusters to a non-resident attribute. AttrContext Pointer to an NTFS_ATTR_CONTEXT describing the destination attribute. AttrOffset Byte offset of the destination attribute relative to its file record. FileRecord Pointer to a complete copy of the file record containing the destination attribute. Must be at least Vcb->NtfsInfo.BytesPerFileRecord bytes long. NextAssignedCluster Logical cluster number of the start of the data run being added. RunLength How many clusters are in the data run being added. Can't be 0. STATUS_SUCCESS on success. STATUS_INVALID_PARAMETER if AttrContext describes a resident attribute. STATUS_INSUFFICIENT_RESOURCES if ConvertDataRunsToLargeMCB() fails or if we fail to allocate a buffer for the new data runs. STATUS_INSUFFICIENT_RESOURCES or STATUS_UNSUCCESSFUL if FsRtlAddLargeMcbEntry() fails. STATUS_BUFFER_TOO_SMALL if ConvertLargeMCBToDataRuns() fails. STATUS_NOT_IMPLEMENTED if we need to migrate the attribute to an attribute list (TODO). Clusters should have been allocated previously with NtfsAllocateClusters(). Adds a $STANDARD_INFORMATION attribute to a given FileRecord. FileRecord Pointer to a complete file record to add the attribute to. Caller is responsible for ensuring FileRecord is large enough to contain $STANDARD_INFORMATION. AttributeAddress Pointer to the region of memory that will receive the $STANDARD_INFORMATION attribute. This address must reside within FileRecord. Must be aligned to an 8-byte boundary (relative to FileRecord). Converts binary data runs to a map control block. DataRunsMCB Pointer to an unitialized LARGE_MCB structure. STATUS_SUCCESS on success, STATUS_INSUFFICIENT_RESOURCES or STATUS_UNSUCCESSFUL if we fail to initialize the mcb or add an entry. Initializes the LARGE_MCB pointed to by DataRunsMCB. If this function succeeds, you need to call FsRtlUninitializeLargeMcb() when you're done with DataRunsMCB. This function will ensure the LargeMCB has been unitialized in case of failure. Converts a map control block to a series of encoded data runs (used by non-resident attributes). DataRunsMCB Pointer to a LARGE_MCB structure describing the data runs. RunBuffer Pointer to the buffer that will receive the encoded data runs. MaxBufferSize Size of RunBuffer, in bytes. UsedBufferSize Pointer to a ULONG that will receive the size of the data runs in bytes. Can't be NULL. STATUS_SUCCESS on success, STATUS_BUFFER_TOO_SMALL if RunBuffer is too small to contain the complete output. Shrinks the allocation size of a non-resident attribute by a given number of clusters. Frees the clusters from the volume's $BITMAP file as well as the attribute's data runs. AttrContext Pointer to an NTFS_ATTR_CONTEXT describing the attribute from which the clusters will be freed. FileRecord Pointer to a complete copy of the file record containing the attribute. Must be at least Vcb->NtfsInfo.BytesPerFileRecord bytes long. ClustersToFree Number of clusters that should be freed from the end of the data stream. Must be no more Than the number of clusters assigned to the attribute (HighestVCN + 1). STATUS_SUCCESS on success. STATUS_INVALID_PARAMETER if AttrContext describes a resident attribute, or if the caller requested more clusters be freed than the attribute has been allocated. STATUS_INSUFFICIENT_RESOURCES if allocating a buffer for the data runs fails or if ConvertDataRunsToLargeMCB() fails. STATUS_BUFFER_TOO_SMALL if ConvertLargeMCBToDataRuns() fails. Returns the size of a given FILENAME_ATTRIBUTE, in bytes. FileNameAttribute Pointer to a FILENAME_ATTRIBUTE to determine the size of. The length of a FILENAME_ATTRIBUTE is variable and is dependent on the length of the file name stored at the end. This function operates on the FILENAME_ATTRIBUTE proper, so don't try to pass it a PNTFS_ATTR_RECORD. Definition at line 34 of file attrib.c. Definition at line 72 of file attrib.c. Referenced by DECLARE_INTERFACE_(), and UpdateIndexAllocation(). Definition at line 160 of file attrib.c. Definition at line 230 of file attrib.c. 264 // Is this a directory? Referenced by NtfsCreateDirectory(), and NtfsCreateFileRecord(). Definition at line 388 of file attrib.c. Definition at line 495 of file attrib.c. Definition at line 599 of file attrib.c. 652 // Do we need to extend the attribute (or convert to attribute list)? 661 // Can we resize the attribute? 669 // Are there more attributes after the one we're resizing? Definition at line 766 of file attrib.c. Definition at line 825 of file attrib.c. 847 // Normal data run. Definition at line 896 of file attrib.c. Referenced by AddRun(), FreeClusters(), ReadAttribute(), and WriteAttribute(). Definition at line 966 of file attrib.c. Referenced by ConvertDataRunsToLargeMCB(), FindRun(), GetLastClusterInDataRun(), NtfsDumpDataRuns(), PrepareAttributeContext(), ReadAttribute(), and WriteAttribute(). Definition at line 1422 of file attrib.c. Referenced by FindAttribute(), GetFileNameFromRecord(), GetNfsVolumeData(), GetStandardInformationFromRecord(), NtfsDumpFileAttributes(), NtfsGetSteamInformation(), NtfsReadFile(), and NtfsWriteFile(). Definition at line 1340 of file attrib.c. Definition at line 1388 of file attrib.c. Definition at line 1010 of file attrib.c. Definition at line 1057 of file attrib.c. 1186 // Is DestinationAttribute the last attribute in the file record? Referenced by FatExamineFatEntries(), GetDiskFreeSpaceW(), HandleNotify(), NtfsAllocateClusters(), NtfsGetFreeClusters(), DriveVolume::ObtainInfo(), and SetNonResidentAttributeDataLength(). Definition at line 1942 of file attrib.c. Referenced by NtfsGetBothDirectoryInformation(), NtfsGetDirectoryInformation(), NtfsGetFullDirectoryInformation(), NtfsGetNamesInformation(), NtfsMakeFCBFromDirEntry(), NtfsMoonWalkID(), NtfsSetEndOfFile(), and NtfsWriteFile(). Definition at line 1935 of file attrib.c. Definition at line 1766 of file attrib.c. Referenced by GetBestFileNameFromRecord(), NtfsGetBothDirectoryInformation(), and NtfsMakeRootFCB(). Definition at line 1865 of file attrib.c. 1883 // Normal data run. GetPackedByteCount Returns the minimum number of bytes needed to represent the value of a 64-bit number. Used to encode data runs. Definition at line 1803 of file attrib.c. Definition at line 1897 of file attrib.c. Referenced by NtfsGetBothDirectoryInformation(), NtfsGetDirectoryInformation(), NtfsGetFullDirectoryInformation(), and NtfsMakeFCBFromDirEntry(). Definition at line 1267 of file attrib.c. Referenced by FindFirstAttribute(), and FindNextAttribute(). Definition at line 1214 of file attrib.c. Definition at line 1574 of file attrib.c. Definition at line 1680 of file attrib.c. Definition at line 1712 of file attrib.c. Referenced by AddRun(), FreeClusters(), and NtfsDumpDataRuns(). Definition at line 1747 of file attrib.c. 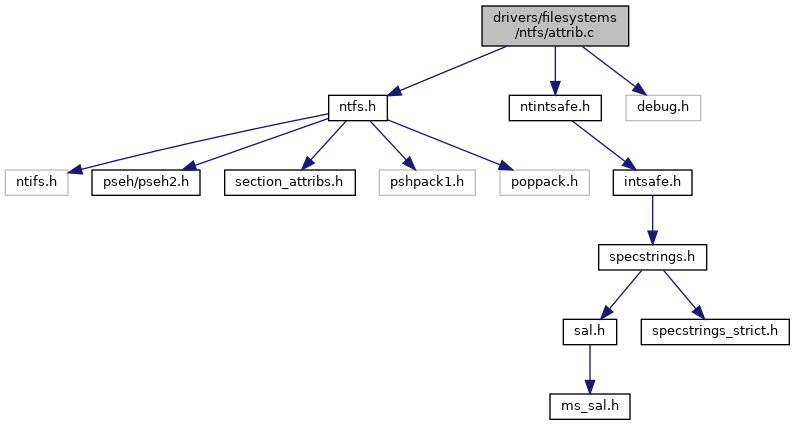 Referenced by IncreaseMftSize(), NtfsDumpFileRecord(), NtfsGetBothDirectoryInformation(), NtfsGetDirectoryInformation(), NtfsGetFullDirectoryInformation(), NtfsGetNamesInformation(), and NtfsGetVolumeData(). Definition at line 1433 of file attrib.c. Definition at line 1499 of file attrib.c. Definition at line 1451 of file attrib.c. Definition at line 1481 of file attrib.c. Definition at line 1466 of file attrib.c.